Now is the time to begin the planning and preparation of fields to attract doves during the upcoming season. The mourning dove is one of the most popular game species in the Southeast, and fall dove shoots are a South Carolina tradition. Large numbers of doves will feed on waste grains and weed seeds in harvested peanut, corn and wheat fields. Fields can also be planted in millet, sorghum, sesame, corn, sunflowers or other crops and managed specifically for dove hunting. It is legal to plant a field with grains attractive to doves, and harvest or mow all or part of it, or none of it at all, and shoot doves over the area. Well-managed dove fields provide benefits to doves and other wildlife before and after the hunting season. Landowners interested in dove field recommendations should contact the S.C. Department of Natural Resources (DNR) Small Game Project at (803) 734-3609 in Columbia, or a DNR regional wildlife biologist. Dove field planting information can also be found on the DNR website at http://dnr.sc.gov/pubs/AttractingDovesLegally.pdf. Mourning dove season dates for 2016-17 will be Sept. 3–Oct. 15, Nov. 12-26 and Dec. 15–Jan. 15, 2017. Afternoon hunting only is allowed from Sept. 3-5. The remainder of the season, shooting hours will be one-half hour before sunrise until sunset. This year the bag limit will decrease from 15 to 12. The daily bag limit is also 12 this year. Several factors should be considered when planning a dove field. Larger fields are often more attractive than smaller fields. Generally, a dove field should be a minimum of three acres in size and should be designed to allow at least one acre per hunter. Fields should not be located near busy highways, residential areas, schools, hospitals, or other areas where safety or noise could be a concern. Also, doves are easier to attract if fields are located within an agricultural landscape, rather than within a large block of woodlands. A single field can be manipulated to attract good numbers of doves through the season by alternating strips of several different crops. For example, browntop millet, which will mature in 60-70 days, will provide food during the early dove season. Dove proso millet will mature in 80-90 days and will be available after the browntop falls. Corn or sunflowers could be planted on remaining strips to provide late-season food sources. Doves prefer small-seeded, black-oil-seed varieties of sunflowers over the larger striped-shell sunflowers. Dove fields should be planted on dates that allow the seed to mature about two weeks prior to hunting, which allows doves time to locate the food source and become accustomed to feeding in the field. Planted strips within fields should be at least 30-50 feet wide, and kept as weed-free as possible. Doves have weak feet and will not use a field where they have to scratch and search for food. For this reason, it is best to plant crops in rows to facilitate cultivation. 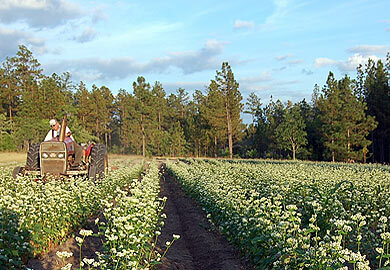 Herbicides labeled for the various plantings are also recommended. Row plantings also make finding downed birds easier. In fields with heavy weed growth, light discing of strips throughout the field will improve the attractiveness of the field to doves by exposing seeds of native weeds and planted crops. Overshooting will drive doves away from even a high-quality dove field. A field should not be hunted more than once a week, and the birds should be allowed to feed unmolested during the last two hours of daylight. A particular field should be hunted morning or afternoon, not both. After the close of dove season, fields should not be plowed under. Crop residue as well as associated weed seeds will continue to provide doves and other wildlife with a reliable food source throughout the remainder of winter and early spring.